We create a busy, fun day filled with creative projects, plenty of physical movement and lots of love. We enjoy playing outside in the sunshine and snow! Learning how to share is a skill we work on with all children. Age appropriate activities are planned on a daily basis. Children are introduced to three letters, one shape and one color every month. Children participate in circle time each day. 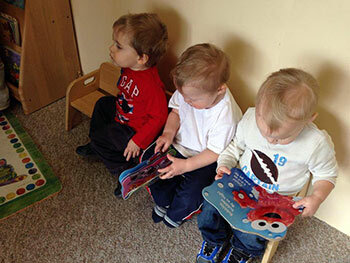 Circle time includes singing many songs, engaging the children in finger plays and reading stories. Each child is offered lots of cuddles and hugs throughout the day. Through daily activities such as games and songs, our children learn to socialize effectively with each other. Our teachers assess and work with your child to develop self-help skills while being nurtured with lots of hugs and individual attention throughout the day. In Pooh’s Corner, children learn to express themselves through various artistic activities. Dancing, singing, painting and pretend play allow your child to express themselves in a rewarding and nurturing environment while learning to share ideas and social communication with other children. By keeping active, our children improve coordination, build motor skills and discover his or her physical abilities in a safe and secure facility. We have lots of fun playing in the sunshine and snow including our huge playground built for a safe and fun-filled day.